Added by RJ Smith 11 months ago. Updated 10 months ago. Is there not a feature for this? I can redo my playlist but with over 1Tb of music that is a 48-minute wait. To long. If this was the 1980's I could go to the record store and get back home and play the album on my turntable faster. There has got to be something I'm missing here. Hand down Audacious is the best sounding player I've tried and I've tried a lot of them. Plus to have the cover art full screen is a dream come true. If there is no scan for new files at startup there has to be something I can click on that will do it faster then regenerating my playlist, but I'm not seeing it. I'm using 3.8 version. This is what the Search Tool plugin and its "refresh" feature are for. It's not perfect, but give it try if you've never used it before. It might help. Oh! Nice. Way faster and it looks like it did a good pick up on the newly added tracks. I also have the QT 3.8 version clicked Refresh and after 40 minutes it's still going. It looks like it's just redoing the complete playlist rather than just add the missing files. That's a big fail for the newer version. An auto search for new files at the start-up is still the way to go. Why should we have to do it when other players with crappy sound quality can do that is a few seconds? The code can't be that hard to make. Wish I know how to write things like that. I would be on it. If it had that feature I would not get the same response everytime someone asks me what player do you use. Me: I use Audacious it has the best sound quality of any player. Me: the only drag is it does not search for new files at the start. You have to do that. them: Oh that's why I've never heard of it. it's out of date. The same thing happens when I have people are over and they hear the sound quality. It's "my player doesn't sound that good?" It is truly a shame this one feature holds audacious down to the B-list of player when it's the best sounding one out there. Is there detailed info page or videos about the player? videos would be helpful to everyone. I have found some info pages but most are incomplete or just badly written. I also have the QT 3.8 version clicked Refresh and after 40 minutes it's still going. It's a bit confusing because there are two different types of "refresh". The "refresh" icon-button in the Search Tool pane will scan for new files. 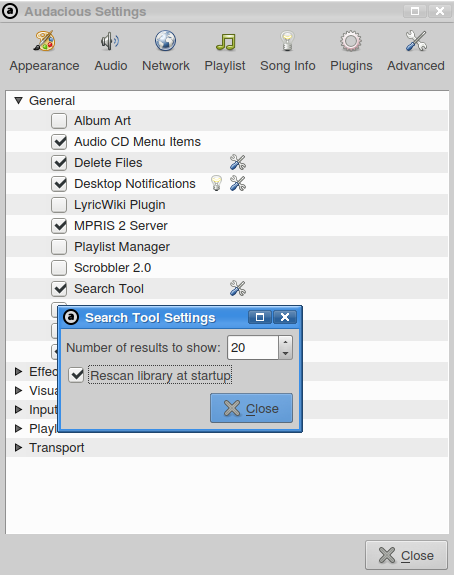 Playlist -> Refresh from the menu bar will reload metadata for the whole playlist (and will not scan for new files). The Qt interface is no different from the GTK interface in this regard. We still need an auto on start-up Then I can turn people on the best sound player out there. Without them complaining about having to do other things before clicking play. It's truly sad that most all other players can do this and sound like the music is coming out if a coffee can. When we that truly can hear the quality can't. 2018 and we are behind with something so simple. Let alone the unwillingness to even consider. When chatting with the makers They get a bit rude about it. Can anyone write a plugin for it?????? would be the number one downloaded plug-in, for the player in no time.